Official IDs should take care of the contents and clarify as promotions are made to make people believe in them. 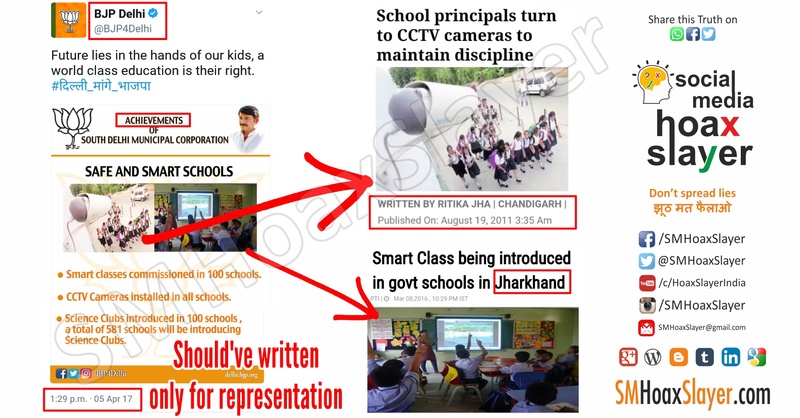 Although the images in media also may not be exactly of what they claim to be like Chandigarh or Jharkhand but the point is, these images have been on internet for a long time, used by many, so the official IDs should clarify that these image are only for representation. They even haven’t mentioned which school or when did they do it. With infrastructure increasing in most of Chandigarh’s private schools,principals have found it difficult to monitor activities both inside and outside the classrooms. To solve the problem schools have now turned to CCTV cameras which are connected to Digital Video Recorder (DVR) systems,that now enable principals to keep a tab on everything from their offices. Over the past year,the CCTV cameras have become a common feature in nearly 55 of the total 63 private schools in the city. They are primarily installed in corridors,classrooms,playgrounds,library,reception hall,laboratories and the entry gate. For the principals the cameras have emerged as an effective tool in ensuring discipline,as they feel that the cameras create a psychological impact of ‘being under surveillance’ not only among students but teachers and non-teaching staff. Sanjay Sardana,Director of Manav Mangal group of Schools told Newsline: “The principal cannot be present everywhere all the time. But the cameras have done away with this limitation since everyone in the school,especially the students,gets a sense of being under surveillance and hence maintain discipline”. Additionally,the DVR allows authorities to review events that have occurred over the previous seven days. This allows school heads to investigate complaints of bullying,misconduct or scuffles among students or even teachers by reviewing the stored footage. “In case the principal is not in the office,she can always view the previous days happenings. To look into the complaints,the principal can make use of the recorder in finding out that what went wrong. This way the system allows a fool proof inspection,” said Punita Singh,counsellor at Carmel Convent School,Sector 9. Mahbubnagar: The launch of smart classes in government schools is expected to change the face of education system in Mahbubnagar district. According to the District Education Officer (DEO), Vijaya Laxmi Bai, smart classroom system- which is comprised of the information technology and audio visual effects- will be installed soon. “The smart class system is a new concept for India, particularly to government schools. The system will turn classrooms into smart classrooms with its dedicated software and necessary content developed in the regional languages,” said the DEO. In smart classrooms, a projector displays the subject contents, either being taught by an in-house teacher or an external teacher from a faraway place through the video conferencing method. Initially, the smart class teaching system is being implemented in the high schools for students from Class VI to X. There are about 571 high schools in the district, out of which 360 schools have come forward to implement the system. “In fact, we had a target of 250 schools, but we have received an amazing response and more than 360 schools have come forward to implement the innovative teaching system,” informed the DEO. With the objective to implement the project at a quick pace, the district Collector T.K. Sridevi had conducted a review meeting with the district officials. Though the district administration has thought to spend Rs. 85,000 for each school, only Rs 60,000 are available for a school. This is Uttar Pradesh, not Delhi. This #FakeNews is repeated exactly after 2 years. August 7, 2018 Hoax Slayer Comments Off on This is Uttar Pradesh, not Delhi. This #FakeNews is repeated exactly after 2 years. Minimum Balance Requirement in Jan Dhan Accounts. Really? January 25, 2019 Pooja Verma Comments Off on Minimum Balance Requirement in Jan Dhan Accounts. Really? Few of these photos are fake and few are old. April 23, 2018 Hoax Slayer Comments Off on Few of these photos are fake and few are old.